The Brounker Family remains difficult to say the least, as our attachment to them dates back to the early 1500s. I have found another connection to the family, but it was not until the 1900s. The furthest back I can find is the father of our connection Joan. We first learned of Joan in the inquisition post mortem of the will of Richard Smyth as she was mentioned as the wife of Richard’s son, John Smythe. Joan was born the daughter of Robert William Thomas Brounker and Ursula Ann Gouldinge, in 1500 at Melksham, Wiltshire, England (just south of Corsham) and died about 1560 in Wiltshire, England. Robert Brounker was born about 1465 in Wiltshire, England and died in Jan 1537 in England. Joan’s mother, Ursula, was born about 1470 in England. John Smythe and Joan Brounker had four children that I am aware of: John Smythe (b. 1521), Thomas Smythe (b. 1522), Henry Smythe (b. 1523), and Elizabeth Smythe (b. 1524). Our Smith Linage continues through Thomas Smythe and can be followed in the Smith Family history. Robert and Ursula, however, had at least one more child that I am aware of, Henry Brounker. As times were then (although they still are today for some people), to better one’s family, you tried to marry off your children into higher class families or those with more status and money. The Smith’s and the Brounker’s were no different and managed quite well. As a matter of fact, the Brounker’s managed even better, but lost the name in the process as best as I can tell. Henry (b. abt. 1510) married Ursula Yate (b. abt. 1520). They had a daughter, Susan Brounker, who was born about 1553 in Wiltshire, England. Susan married a Henry Gifford (b. abt. 1550) and they had a daughter, Anne Gifford, who was born in 1574 in Hampshire, England. Now Anne married a Mr. John Portman (b. abt. 1570) in 1595. They had two children: Anne Portman (b. 1611) and Joan Portman (b. abt. 1629). Anne Portman’s parents arranged a marriage for her into the Seymour Family with Edward Seymour (b. 1610). The Seymour’s in the year 1500 were next in line to the throne as Sir Edward Seymour (b. 1500) was the 1st Duke of Somerset and he also held the title of 1st Earl of Hereford. As there was a change in command at the throne, he lost his Duke title but still remained important to the land. 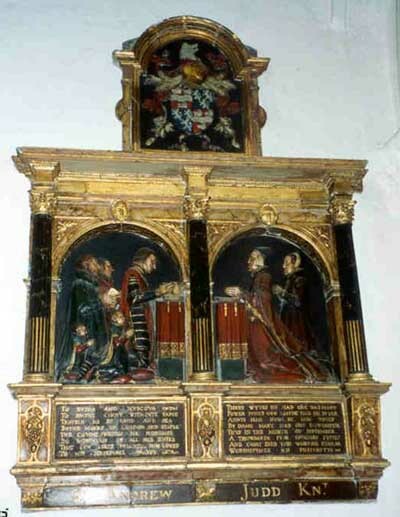 His first son, Edward (d. 1593) became the Sheriff of Devon. This part of the family worked back up through the ranks as they were knights of the crown and soon increased to Barons and Lords again while taking our Brounker blood with them in 1630. Edward’s (b. 1500) second son, Edward (b. 1537 / d. 1621) retained the title of Earl of Hereford and just two generations later regained the tile of Duke of Somerset. Without going through all the marriages and children, the Seymour’s with the first son linage (and now with the Brounker Blood) arranged a marriage in 1786 between Hugh Seymour and Anne Waldegrave. This time the Baron’s and Lords married the daughter of an Earl. As an Earl / Count / or Countess are 4th in line to the crown, the Seymour’s have managed to marry into royalty. Now in 1854 as one Seymour Countess Adelaide Seymour married another Earl Frederick Spencer the fate of royalty was sealed. And if any one keeps up with the Royalty of today, they would know that Spencer was the maiden name of the famous Princess Dianna. That is correct. The Brounker Family made it. Robert Brounker is Princess Dianna’s 12th Great Grandfather. She married Prince of Wales, Charles Phillip Arthur George Windsor, the son of the Current Queen of England. But wait there is more. Didn’t we have another connection to the queen? The current Queen of England’s mother, Queen Elizabeth Bowes-Lyon, is among our relations. We can trace the Queen Mother’s linage back to the Warner and Townley Families of which are connected to the Smith Family in the early 1600s. But you can read more on that topic under the respective families below. A good site to follow the lineage from Robert to Princess Dianna is : http://freepages.genealogy.rootsweb.com/~jamesdow/s040/f027077.htm . Now back to Edward’s (b. 1500) second son’s linage who regained the title of Duke of Somerset. He married a Ms. Frances Devereaux (b. 1590 / d. 1674). Frances is the daughter of Robert Devereaux, the 2nd Earl of Essex, of whom we will talk more about in the Blount Family section. Robert had a sister named Penelope who first married a Robert Rich, 1st Earl of Warwick. Several of our Smith family were knighted by this Earl of Warwick. While Robert and Penelope were married she had an affair (openly to the public – and had children) with Charles Blount, 1st Earl of Devonshire. Charles is our Sarah Blount’s uncle of which we will get to in the 1600s. Sarah married our Sir Thomas Smythe. So not only are the Smith’s connected with marriage of John Smythe to Joan Brounker to the Brounker family who in a few generations married into the Seymour family, by another strange twist of fate, marriages took place which connected us with the Blount, Devereaux and Rich royal families who are also married to the Smiths. I will mention this again later, but one more connection here is through Sir Robert Rich and Penelope’s daughter Lady Isabelle Rich. She married our Sir John Smith (b. 1580). John was the brother of our Christopher Smith (b. 1591) and the son of Sir Thomas Smythe (b. 1558). Ok that is enough for now on the Brounker Family and its connections. But before we get too much further, I want to discuss the unnamed brother. I have received from another genealogist who just happens to be a “Judde” from the UK, a portrait that is shown here and was painted in 1560 as shown on the table in the middle. To some it looks like 1460, but none of these individuals were born till after 1500. This portrait is of the unnamed brother, who now has a name, William. This Portrait is of William Judde and his wife, Joan Cromwell. The Cromwell’s are also mentioned in our Richard Smyth’s Will. We know all this not only because it hangs in the Dulwich Art Gallery in South East London today but if we notice in the upper left hand corner of the picture is a small coat of arms. Upon closer observation, this is the Judde Coat of Arms. In the upper right corner is the coat of arms belonging to the Cromwell’s. The skull on the table not only represents death, but mortality, eternity, and repentance. We know they were of the Catholic faith as Joan is carrying a small pray book used by the Catholics. The inscription on the table reads: “The world of God hath Knit not Twayne – and Death shall not divide again”. And the inscription on the table at the bottom reads, “Live to die and die to live – eternally”. And at the top by the single candle it reads, “Thus consumeth over time”. During the 1500s, death was all too common with the lack of medical knowledge and therefore was not as tragic as we see it today. The inscriptions all point to the fact that death was a natural part of life and was one to be welcomed as you were to go to a better place. 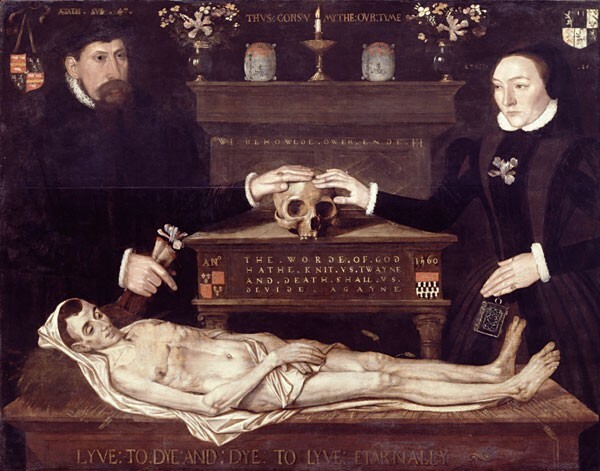 I am assuming that William and Joan has only one son (lying on the table and represented by the single candle) and had the portrait painted to remember him by. Ok that is enough of the Art lessons. Now John’s youngest son, Andrew is the one our lineage goes through. Andrew was born about 1492. When he was 17, in 1509 he was given to apprentice to John Buknell for a period of 8 years. When you were an apprentice back then, you were taken in as a son with no pay, just room and board. You didn’t live with your family. Your job was to learn as much as possible. John Buknell was a Skinner and Merchant of the Staple of Calais. On the 23rd of March 1517, we found the first evidence of Andrew as a Merchant of the Staple which meant that he was released from his apprenticeship just a little early, by paying the duty for a cargo of wool shipped to Calais. From this point on, Andrew was recorded frequently. He would have most certainly known our John Smythe as he too was a Merchant. In the year 1520, Andrew capitalized on his training and became a full member of the “Skinner’ Company” Guild in London. He paid 4 Shillings (entry monies) to join the Fraternity of the Assumption of our Lady in London. He was high on their list of important members by 1524. In 1522 – 1523, he belonged to another Guild, the Fraternity of Corpus Christi. It was found in the account books of the Skinners Guild that Andrew paid 20 Shillings to become one of the “New Brethren”. We next find Andrew on the will as a co-executor of his future father-in-law along with Mr. Mirfyn’s own son. In 1533, he became a Master of Skinners and was so for 5 more times. This must have been a high honor. The Skinners was a Guild or group of Merchants for a specific commodity, say Cloth or Steel. He was elected the head of their group six times. He also was one of the co-founders of the Muscovy Company, that his grandson, Sir Thomas Smythe, was in charge of later. In 1534, Andrew married a Ms. Mary Mirfyn, the daughter of the man he was co-executor with her brother. Apparently a good friend of the family, Mary was married to Andrew at the age of 17. Mary was born in 1516, while Andrew was 42 at the time of marriage. Together they had 5 children: Alice (b. 1535), Elizabeth (b. 1537), Andrew (b. 1539), Thomas (b. 1541), and John (b. 1542). Mary died for reasons unknown in 1542. Andrew remarried about 1542 to a lady named Agnes. That same year, Andrew is found an Alderman who signed to verify the last will and testament of none other than King Edward VI. (See http://www.tudorplace.com.ar/Documents/EdwardWill.htm ). Of what significance I know not, but it was recorded in Sep. 1555 as well that Sir Andrew presented the King with a purse containing a thousand marks of gold. This is “mucho” money in those days. He was giving the king money. The only King in 1555 was the consort [soon to be husband] of Queen Mary (Bloody Mary), Philippe of Spain at the Staple Inn. During Mary's reign Sir Andrew Judd's protestant sympathies brought him into conflict with Stephen Gardiner but he appears to have retained Mary's trust. (See H. S. Vere-Hodge, Sir Andrew Judde (privately printed, Tonbridge School, 1953 – which is also found in Foxes Book of Martyrs as per the following website: http://www.hrionline.ac.uk/foxe/apparatus/person_glossaryJ.html. I wish I knew the whole story here, but I don’t and will have to move on. In 1556, Andrew was recorded in the Skinners Hall as being one of two who donated money to construct the ceiling of the Skinner Hall. As a reward, both men had their coat of arms carved into the wall of the Hall itself. Between the years of 1556 and 1558, Sir Andrew was purchasing properties at Ashford. This estate was eventually passed on to his daughter Alice and so on to her son, Sir Thomas Smythe [our ancestor], who inturn also became a benefactor to the Tonbridge school as his grandfather was. Between 1557 and 1558, he was made Surveyor General of all the London Hospitals. SIR ANDREW JUDDE, Knight and Alderman of the Cittie of London, 2 September 1558 (5 & 6 P & M). To be buried in the parish church of Sainte Helene nigh Bishopsgate in London as right vnto the place there whereas the bodie of Agnes my late wife lieth buryed as couvenient may be. My executors shall cause a Tombe or Monument wt a memorial of me to be erected and set apon my grave. To Dame Mary Judde my welbeloved wif in satisfaction of dower she may claim, my mannors of Eshetesford [Ashford] otherwise called Asheford and Esture in Kent which saide manors be of yerely value of £73 and al that my mannor of Barden in Countie of Hertford of yerelie value of £40 and my lands &e in the Towne, parish and feelds of Barons in the countie of Surr[y] of yerelie value of £28. To hold same to her for life and after death of said Dame Mary the mannor of Asheford, Esture and Bardon to John Judde my heire apparent and for lacke of yssue to Richard Judde my sonne and for lack of heires to my right heir. To the said John Judde my sonne my messuage and lands in the parish of Spenshur ats Spelhurst in Kent, called Codds, of yerelie value of £5 and my lands &e in Bidborough I purchased of William Vmble of yerelie value of £4. 10. Also my mannor of Downe in Kent and al other my lands in Downe and Corodame in Kent of yerelie value of £10. And where I, the saide Sr. Andrewe Judde have builded and erected a free grammer scole at Tonbridge in Kent, to have contynuance for euer, for the maynteaunce and contynuaunce wherof I geve will and bequeath vnto the Maister and Wardeynes of the fraternitie of Corpus Christi of the crafte or misterye of Skynners of the Cittie of London all that my cloase of pasture with thappurtenances called the Sandhilles sett on the blacke (sic) side of Holbourne in the parish eof Sainct Pancras being of the yerelie value of £13. 6. 8. and my messuage in tholde Swanne Alley in Tames Strete in parishe of Saint Laurance Poultney in London of yerelie value of £6. 3. 4. and my messuage in parish of Alhalllowes in Gracechurch Strete now in the tenure or occupacion of William Judde, skynner, [and other property, detailed, in London]. The said Maister and Wardeyns shall yerelie content and paye to the scole maister of my saide free grammer scole at Tunbridge for his stipend and wages £20 at four termes in the yere. To the Vssher of the saide scole £8. Item I will that the saide Mr. and Wardeynes for the tyme being shall oncs in the yere for euermore ride to visite the saide scole and there to see and consider whither the scole maister and Vssher of the saide scole doo their dueties towards the scolars in teaching of them of vertue of lernyng and whither the scollars doo of their partes vse themselfes vertuose and studiouse and whither they doo observe and kepe thordres and rules of my saide free scole or not. And I will that the foresaid maister and wardeyns in their said visitacion shall take ordre that if any of the rules and ordres in my said free scole shall fortune to be broken either by the Maister or Vsshier or by any of the scolers, that then the same may be furthewith refourmed and amended according to ther good discreacions and as my speciall trust and confidence is in them. And I will that the saide Mr. and Wardeynes shall yerelie have for their labours and paynes therein to be taken and for their expences in that behaulf 40s. yerelie. [Bequest to six poore almes men in my almes houses within the cloase of Sainte Helens to euery of them 8d. weeklie and 35s. uppon coales yerelie]. And the overplus therof (i.e. of rents &e.) remayning I will shalbe to thuse and behoulf of the said Companye of Skynnars to ordre and dispoase at their willes and pleasures. Executors: Dame Mary my wif and John Judde my sonne and heir. Witnesses: John Southcote, Germyn Cyoll, William Hagar. All in all, the Judde Family up until this point was looking good. With a long history, the family did well with the pinnacle at Sir Andrew. Sir Andrew’s best accomplishments were becoming Lord Mayor of London 1550-1551, Mayor of the Staple of Calais, six times Master of the Skinners Company, and Founder of Tonbridge School 1553. His daughter Alice married our Thomas “Customer” Smythe. To continue with the line, you can pick it up with the Smith Family History. 1. Purton, Rev. R.C., “In Transactions of the Shopshire Archaeological Society #51, pp. 127 – 138. 2. Lambarde, Fane, “In Archæologia Cantinaz” – transactions of the Kent Archaeological Society, Vo. III, 1913. 3. Hope, Valerie, “My Lord Mayor: 800 Years of London’s Mayorality”, 1989. 4. Lewisham: Lewisham Antiquarian Society, “Calender of Wills relating to the County of Kent proved in the Prerogative Court of Canterbury 1384 – 1559”, 1890. 5. Wriothesley, Charles, “A Chronicle of England during the Reigns of the Tudors, from 1485 to 1559”, Camden Society.